Finding answers to complex challenges has never been easier. With 6 Integrated Instruments, 43 Precision Measurements, Histogram Analysis, Integrated Power Analysis and Advanced Triggering Capabilities the 7000 Series provides simple yet powerful insights into your signal under test. The UltraVision II family of oscilloscopes combine 7 Instruments in 1. See how the power of these 7 integrated instruments can help solve complex debug challenges. Quickly isolate and identify elusive signals with our powerful zone triggering capability. Simply draw one or two easily defined zones to identify only signals of interest and speed your debug. Use the integrated Power Analysis option to quickly measure key attributes of power quality and output ripple of your switching supply. Add our Ultra Power Analyzer Software Suite for complete characterization of switch mode power supplies. With the most standard measurements in the class (41) utilizing up to the full 500 Million Points of memory you can quickly characterize your design to get the data you need with consistent, stable results. 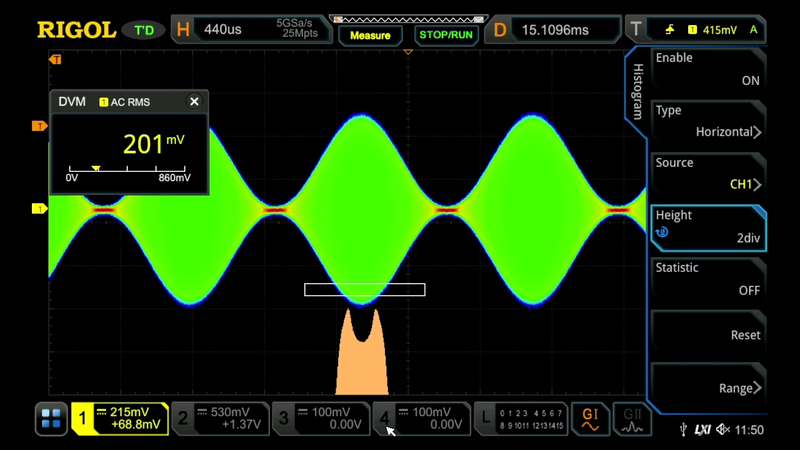 Visually analyze modulations, noise, jitter and other signal characteristics with the customizable histogram display. Easily characterize signal behavior versus time or amplitude and display both a visual histogram as well as statistical data associated with the reference area. Solve complex debug challenges with serial bus triggering and decoding. Supporting most of today's common standards like I2C, SPI, CAN, FlexRay, I2S, 1553, and others the 7000 Series will help you quickly solve embedded communication issues. Combine the power of advanced search and mark, zone trigger, and interactive protocol event tables to simultaneously analyze up to 4 serial buses. Quickly evaluate signals for out-of-bounds (OOB) conditions, characterize signal jitter or perform manufacturing pass fail testing. With simple mask creation, statistics, and event notifications the 7000 Series provides efficient mask testing for pass/fail analysis and device characterization.